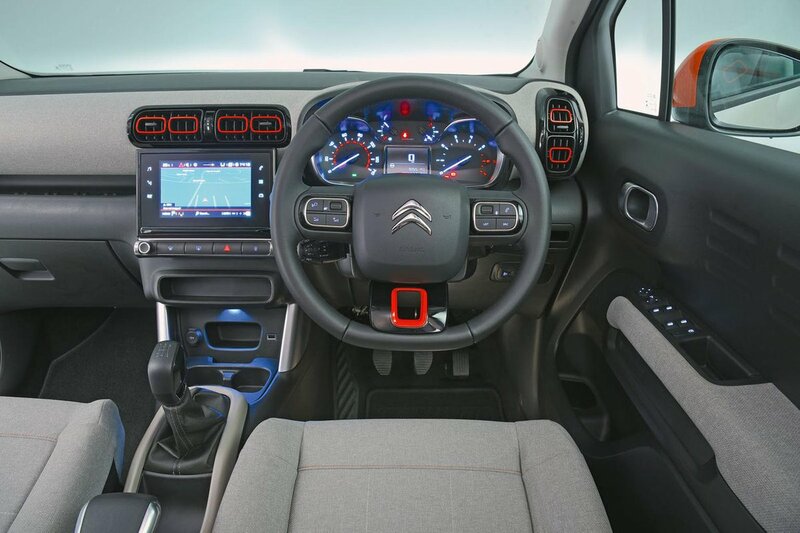 Citroën C3 Aircross Interior, Sat Nav, Dashboard | What Car? If you’re in the market for an SUV, there’s a good chance that you like to sit quite far from the road. 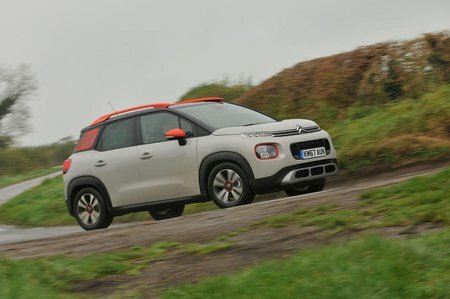 If so, you’ll find plenty to like about the C3 Aircross because, with its driver’s seat set to its lowest position, you’re a few centimetres farther from ground than you are in a Seat Arona or Kia Stonic. Unfortunately, the driver’s seat doesn’t provide much in the way of lower back support, so the C3 Aircross isn’t very comfortable on longer journeys. Adjustable lumbar support would help, but it isn’t available. Meanwhile, only range-topping Flair models come with a front centre armrest. It’s also really annoying that the only way to control the air conditioning is to use the infotainment touchscreen. Even just tweaking the interior temperature requires you to visit a specific menu and stab away at the screen repeatedly. Forward visibility is good, helped by the lofty driving position. Over-the-shoulder vision isn’t so impressive, though – particularly if you opt to have decals on the rear three-quarter glass area. It’s also disappointing that rear parking sensors are standard only on range-topping Flair trim, although you can add them as an option on mid-spec Feel. Meanwhile, a Park Assist Pack (front parking sensors and a self-parking system) is optional on Flair. 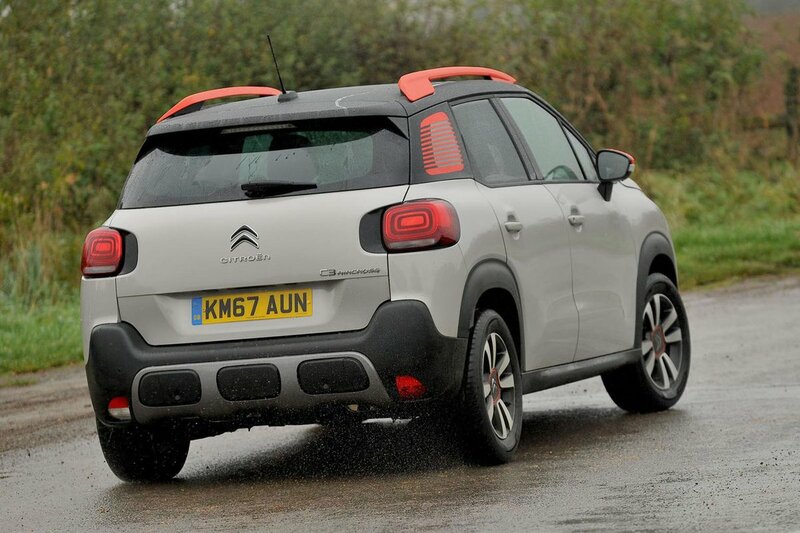 Infotainment is not one of the C3 Aircross’s strongest suits. The 7.0in touchscreen that’s standard on all trims apart from entry-level Touch does not have the contrast or crispness in graphics you might hope for. And the delay between pressing the display and anything actually happening is often long enough for you to make a cup of tea. The menu layout isn’t particularly user-friendly, either, although you do get a DAB radio, a USB socket and Bluetooth on all trims. Step up to Feel and you’ll get a better stereo along with Apple CarPlay and Android Auto smartphone mirroring, while range-topping Flair models also come with built-in sat-nav. There’s more to get excited about inside the C3 Aircross than in most small SUVs. From the art deco air vents to the silver accents below the touchscreen, everything has been designed to be interesting to look at rather than purely functional. You can even choose from various colours schemes if you’re prepared to pay extra, including a two-tone tan and black dashboard and seats, or grey seats with red highlights on the dash. Just bear in mind that the quality of interior plastics isn’t any better than those in the Arona, while fit and finish is actually slightly worse.